Every day millions of people purchase food from cafeterias and dining centers at universities, hospitals, companies, and other public facilities. What if more dishes on offer were appealing and healthy, while helping fight climate change? The Cool Food Pledge is a new platform to help facilities offer diners more of what they want while slashing food-related greenhouse gas emissions by 25 percent by 2030. Dining facilities are a perfect place to start. Food production accounts for nearly a quarter of all greenhouse gas emissions, and helping people increase the share of plant-based foods in their diet is a critical step in reducing agriculture’s pressure on the climate. There’s growing demand, too. In the United States, 39 percent of Americans say they want to eat more plant-based foods, and in Britain, close to half of those surveyed across the food industry in 2013 said their customers want more sustainable food options. The Cool Food Pledge helps signatories track the climate impact of the food they serve, develop plans to sell delicious dishes with smaller climate footprints, and promote their achievements as leaders in a growing movement. Pledge: Signatories pledge to “provide delicious food that is better for the planet” and commit to a collective target of reducing the GHG emissions associated with the food they provide by 25 percent by 2030 relative to 2015—a level of ambition in line with keeping global warming below 2⁰C. The Cool Food Pledge team advises signatories on how to gather the necessary data and conduct periodic monitoring of the associated metrics. 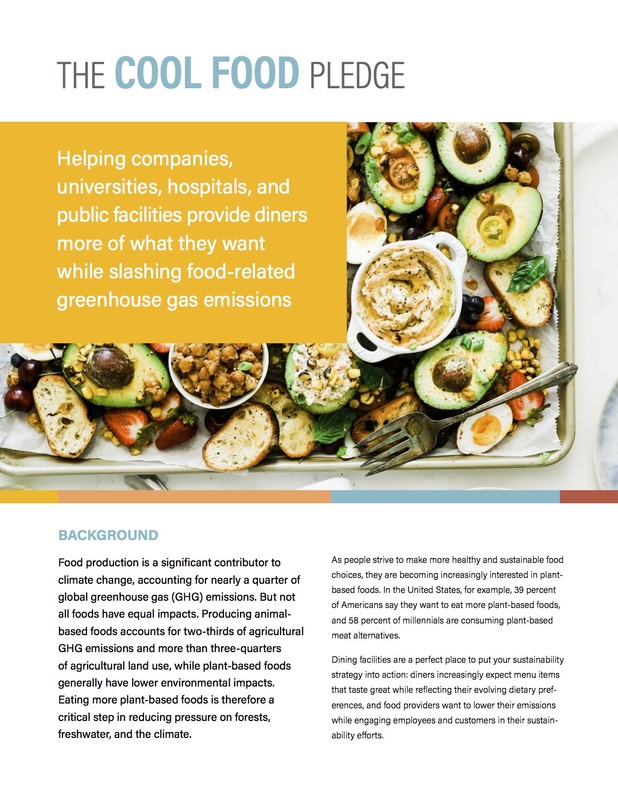 Plan: The Cool Food Pledge team provides guidance to signatories to help them develop a plan for serving more climate-friendly food while meeting other dining-related targets (e.g., number of diners, financial performance, nutrition). The Cool Food Pledge also connects signatories with organizations producing innovative products, solutions, and training. Pledge signatories can share and learn from others about what works. Promote: The Cool Food Pledge team provides inspiring messaging that signatories can use to support their existing sustainability campaigns. A high-profile media and social media campaign will promote signatories’ progress and achievements. Signatories’ collective performance against the GHG target will be published annually, and individual achievements will be celebrated at an annual event. The Cool Food Pledge is an initiative of World Resources Institute, UN Environment, Carbon Neutral Cities Alliance, Health Care Without Harm, Practice Greenhealth, and Climate Focus. World Resources Institute serves as secretariat. The Cool Food Pledge is pleased to have Sodexo as a supporter, helping promote the Pledge’s activities with the dining facilities it serves. The Pledge aims to have 250 signatories by 2021. Questions? Contact Gerard Pozzi at gerard.pozzi@wri.org.